Emily Bennett from University of Portsmouth shares her top tips for promoting Open Access (OA). Back in June we were asked to do a ‘Teachmeet’ session at JISC OA Pathfinder Advocacy day at the University Northampton. This is not something we’d done before, so we were unsure what to expect! around the ‘top tips’ for promoting OA we’ve gathered over the last few years at Portsmouth. We run monthly workshops for academics about OA. These workshops are well attended because they are part of Portsmouth’s Researcher Development Programme, run by the department of Research and Innovation Services. We’ve done quite a bit of work over the last year developing these workshops by distributing questionnaires to explore academics’ existing knowledge of OA before the workshops and using feedback questionnaires afterwards. We are quite pleased with the final result and have released the presentation under the CC-BY licence. So please feel free to download and reuse :) Download the presentation for academics about OA. We have also released the pre and post workshop questionnaires, which can be downloaded from here. Compliance reporting. Every 3 months we compare Pure to Scopus to work out what articles we are missing from Pure. This report gets sent to our Associate Deans for Research, and so passes the responsibility of chasing articles to the faculties. The Library does not validate outputs submitted to Pure that have incorrect or missing information. For example, if they do not include the full-text author’s accepted manuscript version of the article. Instead, we contact the academic and request that they send this information through. We communicate with academics through all channels, including email, social media etc. We’ve got an OA information website and we distributed a printed poster and single page flow chart to all academics. At Portsmouth we’ve got good links between the Library and the Research and Innovation Services (RIS) department. My role as Research Outputs Manager is based in both departments, and we work closely together on our CRIS system, Pure. Also, links with RIS help in the promotion of OA because they have good links with the researchers. In addition to promoting the OA workshop on the Researcher Development Programme that they run, they also produce the Research and Innovation newsletter, which is distributed to all academic staff every 3 months, and includes a ‘Library Update’ section. For example, see page 4 of the Summer 2016 edition. So overall it was a useful and interesting day in Northampton. If anyone wants to know more about our ‘top tips’ then please feel free to get in contact. emily.bennett@port.ac.uk. The Making Sense project had two other teachmeets on the day. Rowena Rouse from Oxford Brookes traced the journey of the OA Pathfinder project with posters about CIAO, MIAO and OA cat. And a short advocacy video by the Dean of the School of Animal, Rural and Environmental Sciences, Professor Robert Mortimer. Professor Mortimer is a strong advocate of open access publishing and needed no persuasion to talk to us on camera about the benefits of OA and how easy it is to deposit research outputs into our institutional repository, IRep. It was the first time we had produced a video aimed at research staff, so we worked with the University Marketing department to develop a brief - for both our benefit and that of the film company. We provided them with background information on the topic and the questions we wanted to ask Robert. On the day the film crew put him at his ease by asking some neutral scene setting questions and then seamlessly moved into the subject questions. Robert was a natural and clearly articulated why he believes OA is helpful to individual researchers, groups and the University as a whole. In case you would like to produce a talking head yourself, here are our top tips and the questions we asked. Another posting from Emily Bennett describing the use of of pre and post workshop questionnaires to help modify and tailor monthly workshops to the needs of the academic. At Portsmouth we run monthly workshops on Open Access, which are delivered by our Research Outputs Manager (ie me!) These workshops are part of our centrally run Researcher Developer Programme and are advertised on our Open Access info web page. The workshops are open to all academics, and hold up to 20 people at a time. We wanted to design these workshops to they were tailored to the needs to academics. In order to do this, we asked academics due to attend each workshop to complete a pre-workshop online questionnaire. This looks at their previous experience and knowledge, plus whether they have any specific needs, such as whether they have funding from a particular funder. The workshop was then designed / adapted from the previous workshop based on this info. After the workshop, the academics are asked to complete a post-workshop feedback online questionnaire, asking what they found useful, how they were going to change their behaviour and how the workshop could be improved. This feedback is used to inform the design of subsequent workshops. This pre and post workshop questionnaire approach is repeated each time the workshop is run, so (in theory at least!!) the workshop should improve each time. Open Access workshop toolkit includes a copy of the presentation and copies of the the pre and post workshop questionnaires. Here Emily Bennett from Portsmouth writes about the development and modifications to their promotional Open Access poster based on academic feedback and the need for clear, attractive, easy to use research portals to encourage academic interest. In response to feedback from academics early in 2015, when interviewing them as part of our Jisc Pathfinder project, we found a clear demand for a one page simple message for what they need to do. This resulted in a promotional poster designed (and re-designed!) in consultation with academics. We originally used a slightly adapted version of HEFCE’s poster. aimed at raising awareness. You may have seen it feature in Jisc’s newsletter. However, by October we had already re-designed this based on feedback to create a much simpler version, which focuses on the one key message. This is available on our website, and has also been printed and distributed to academics and put up on notice boards within faculties. In a similar way, we tried to make sure the appearance of our Research Portal, launched in August 2015, wouldn't put academics off. This is the public front end to our Pure CRIS, and we worked with Elsevier to ensure a clear and attractive site. It’s far easier to ‘sell’ a website to academics that looks professional and tidy, compared to one that looks dated and cluttered. I know this sounds really obvious, but I get a sense it’s sometimes underestimated. It’s still early days, but feedback so far has been good and the Portal has given us a clear focal point for finding out about Portsmouth research. Ruth Stubbings from Nottingham Trent University (NTU) writes about their use of interviews to gain a better understanding of researcher attitudes and behaviours around Open Access (OA). The project group at NTU was keen to explore researcher understanding of open access (OA), plus their attitudes and behaviours in relation to OA publishing, in order to provide more targeted and appropriate support. We chose to investigate researcher attitudes and experiences of open access publishing through semi-structured interviews in the expectation that this would encourage a two way conversation where respondents felt able to express their views in their own words. It also provided a basic framework for the dialogue, allowing us to deviate and probe into different aspects more deeply if when required. The main topic areas covered by the semi-structured interviews were: how the interviewee decides to disseminate their research results; their preferred methods of publication format, and how they choose where to publish; their understanding of OA; whether they publish their results through OA; and finally how the university could help the interviewee publish their research outputs more regularly via OA. The interviews lasted between 30 to 60 minutes. Notes were taken during the interviews, and they were also recorded so that we could transcribe the main themes later. The information obtained during the interviews was then categorised and collated in Google forms. 50 research staff were interviewed across all Schools within the University, 23 of which were female and 27 male. 13% of respondents classified themselves as early career researchers, 35% mid-career researchers and 52% as established researchers - we targeted researchers that had submitted to the last REF and so the relatively high number of mid and established researchers was to be expected. Deciding where to publish: All of the researchers interviewed follow the standard dissemination and publishing practices within their disciplines, with a high proportion highlighting that they have accepted invitations to publish in particular journals or monographs and that they respond to calls for papers. Encouragingly 48% of the interviewees have a strategic approach to the dissemination of their research, although not all of them have formally written it down. Unexpectedly, the impact factor of a journal, reputation and the audience is highly influential when choosing where to publish. Understanding of OA: All respondents understood that OA allows free access to the reader to material published through this route. The majority were supportive of OA and saw the main benefit being the ability to reach a wider audience; few interviewees, however, mentioned the potential of OA to increase an author’s citation rates. Just over quarter (28%) of the respondents linked OA with the need for the author to pay for their research findings to be published and the majority did not automatically associate IRep, our institutional repository, with OA publishing. Only a small percentage (mainly established career researchers) could easily articulate the difference between gold and green OA, plus the University and/or the RCUK policy on OA. Publishing through OA: At the time of the study 64% of interviewees made their research publications available in full text through the institutional repository, IRep. 4.7% had also paid a publisher to make their work available through gold OA. 28% of the respondents had not made their research available through OA. - Producing case studies showing link between OA and improved citations, readership, and to dispel myth of ‘dodgy’ publishing. So how has the findings influenced our work and the support we offer? We’ve formulated a more formal dissemination and researcher engagement plan that has been agreed with the PVC for Research, which has placed a greater emphasis on a multi-pronged approach to communication and advocacy. This in turn has led to the introduction of OA drop-in sessions to supplement the more formal RDF events, and the development of new OA support materials, such as postcards and flyers,and the creation of a short case study video in conjunction with our marketing team. To try to alleviate researcher concerns around copyright and misunderstandings about the need to pay for OA, we have increased the amount of information provided on tools such as Sherpa Romeo and on the differences between green and gold OA. In response to the request to make our systems easier to use, further improvements to our institutional repository submission process will be introduced in the first quarter of 2016. Thanks to Emily Bennett for the following blog about how the University of Portsmouth manage their research outputs . We’ve been busy at Portsmouth this term with all things open access related. I expect we have much in common with other universities; for example, we’ve got a web page about open access, an open access policy, a team in the Library who manage the validation of publications, a CRIS (Pure), website showing content from Pure - Portsmouth Research Portal, all-staff emails sent from our Pro Vice Chancellor for Research, and so on. 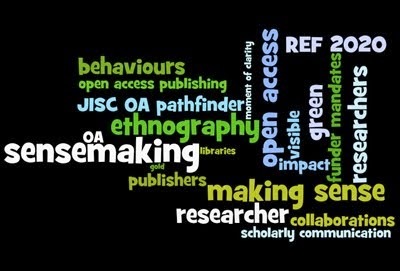 Also, similar to other universities we have a cross-department OA Working Group which includes the Library, Research and Innovation Services, and our OA champion and academic representative, and which drives the direction of open access within the University. ● Research Outputs Manager (ie. me!) has a dual role between the Library and the Research and Innovation Services (RIS) department. I work 2 days in our RIS department and the rest of the time in the Library. This arrangement has been really helpful in facilitating collaboration, which was crucial when setting up Pure. ● As the Research Outputs team in the Library is small, we tend not to offer one-to-one sessions with academics - initially at least. Instead, academics are first encouraged to come along to a workshop, which I run each month on our Researcher Development programme, managed by our RIS department. To guide the design of these workshops, academics are asked to fill in a short pre-workshop questionnaire which looks at what they know about already, and then a post-workshop questionnaire which explores what they will do differently as a result of the workshop. If after coming along to a workshop, they would like a one-to-one, then we’re more than happy to meet up with them. But I tend to find that most people are happy that the workshop gave them an overview, and they just want to ask short, specific questions afterwards. This approach makes delivering training more manageable than trying to offer lots of one-to-one sessions. ● We chase academics for full-text versions if they upload the details to Pure without a copy of the article itself. Although sometimes the academic doesn’t have a copy, it gives us the chance to engage in a conversation with the academic and explain to them why they need it for future articles. Of the 2014-2015 journal and conference articles on Pure, approximately 90% of them have the full-text attached. ● Snapshot comparison between Scopus and Pure to get an estimate of the percentage of Portsmouth articles are missing from Pure. For example, if this comparison were to indicate that around 50% of our research articles may not be REF-eligible as they are missing from Pure, this would be difficult for the faculties to ignore. We will complete this comparison each 3 months, and (hopefully!) see the percentage of articles in Pure rise. The 3 monthly report, which is on an article level, is sent to research leads in faculties to help them chase their academics. I know there are limitations in this approach, not least Scopus’s patchy coverage of a few subject areas, but I feel that we need to start somewhere. The aim is not to get an incredibly accurate breakdown; instead, it’s to gauge or estimate our overall open access ‘performance’. ● Like most universities we have an openaccess generic email address. I’m starting to analyse the kind of questions we’re being asked. This is at an early stage, and it’s nothing more fancy than using the labels in gmail (our email system) to divide the emails into categories. This is very quick to do, and should help us identify key themes in the issues academics are having, which inform the design of our website, training etc. These are a few things we’re working on at Portsmouth. Some of them are very much a ‘work in progress’, and I’ve included them here to hopefully give people ideas. Here Sharon Potter, one of the Research Support Librarians at NTU writes about what they did in OA week. direct result of the OA week activities. Was it a success? We think so! Here at Oxford Brookes, OA content was promoted on our institutional repository RADAR via OA teapot cat and a new twitter account was created specifically for open access @BrookesOA . Our monthly biscuit bar for Learning Resources staff was hosted by the Scholarly Communications team during OA week providing an opportunity to update staff on latest developments.